Featuring of Chinese traditional famous art JingTaiLan - bright and beautiful artwork painted on metal, this amazing vivid bright red vase with image of pair of beautiful peacock birds symbolizes represents wealth, harmony and success . 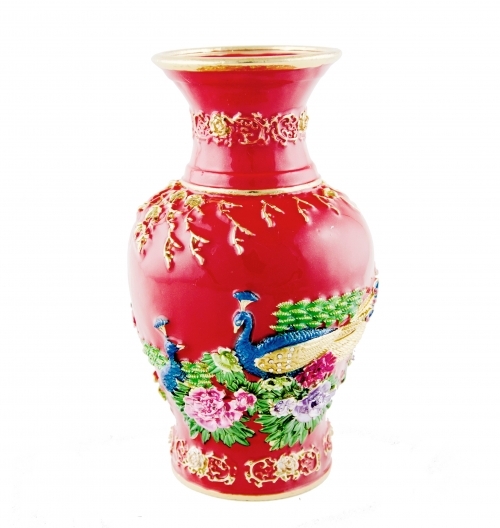 Display this feng shui red vase at home to enhance your surroundings and welcome auspicious energy. Red represents Fire Element in feng shui 5 elements. You can display such red feng shui vase in flying star #9 located to activate auspicious flying star #9. The dimension of the feng shui red vase is approx. 3.75" x 3.75" x 6"(H). The net weight is approx. 2lb. It is made of metal.